The idea for the ceremony was simple. All through our discussions, we had been writing notes and statements on large pieces of paper and posting them on the walls. After photographing them all, to preserve the information, they were taken down and rolled up into a bundle. We all took positions in the long main room in the form of a boat. At the tiller were the members of the original GII, representing the past and our foundation. Along the sides of the boat were the folks from this meeting – the Circle of Wisdom Keepers – representing the present. At the prow were Tiger and Ta’Kaiya – the youth – representing the future. The bundle would be passed from the past to the future and entrusted to the youth. 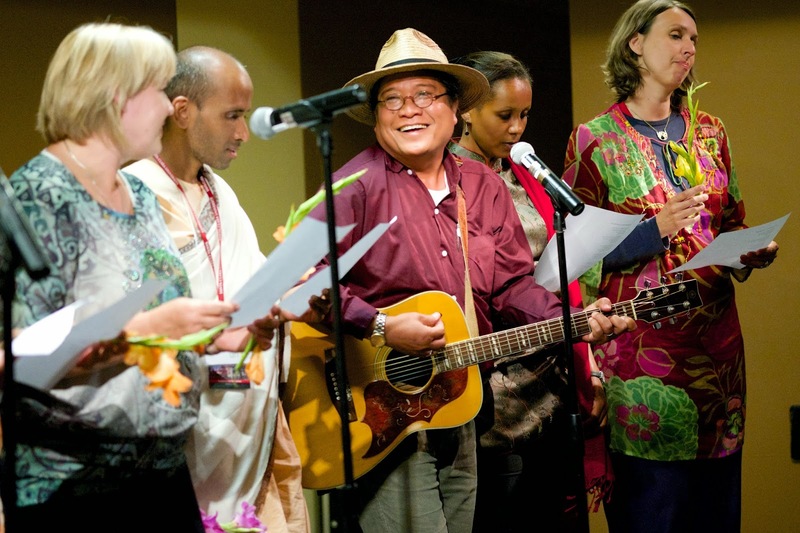 Alejandrino, Fany, Raul, and Sofia – with Erika and Luz translating – represented the original GII. They asked Rachael and me to join them and speak as “bookends”, with Rachael going first and me last. We were both honored to be included in this way. Rachael started by explaining how the GII relates to the URI’s Multiregion. Each of the Latin Americans spoke about their own memories of the earlier days of the GII. Alejandrino spoke at some length. He emphasized how important the ongoing support of “los Wiccas” had been to the success of the GII and that everyone in the room should be thankful for that support. I talked about the importance of the GII being within the URI, how “URI 2.0” was ready and eager to hear the indigenous voice, and how the fact that four of the six of us standing there had been URI Trustees at some point testified to the URI’s support. Raul passed the bundle to the Circle of Wisdom Keepers, who passed it hand by hand to Tiger and Ta’Kaiya at the front of the “boat”. They accepted the bundle with a promise to carry the wisdom of their Elders and of the Earth into the future. What I didn’t know was that this had been the first time that Alejandrino, Raul, Sofia, Fany, Rosalia, and Yoland had all met each other! After Rowan and I had left, the rest of them had continued talking and decided that they should continue meeting, to have a stronger voice in the newly-forming URI. This was the origin of the Global Indigenous Initiative! So, Alejandrino explained, if not for me and Rowan, the GII would never have gotten started. I was stunned, pleased, and noted that this was another example of how CoG’s involvement in interfaith work can have significant repercussions we only find out about years later – in this case 12 years later! How many other, similar stories are out there that we haven’t heard yet? From this point to the final farewells the following morning, the time was mostly spent in socializing and making connections to follow-up later. There was a lot of discussion of having the next meeting in two years in Benin. Dr. Erick Gbodossou of Senegal maintains a center in Benin with sufficient infrastructure to support us. 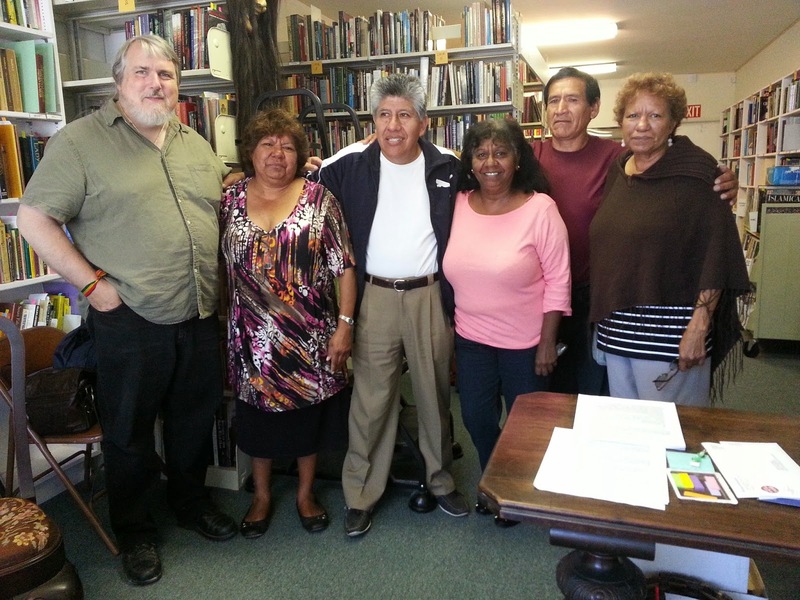 Several of the representatives stayed in the Bay Area for up to a week after the GII meeting. Raul and Alejandrino stayed at Rachael’s. Coralie, Glenis, and Cheryl stayed at a hotel near me, then later, after Raul and Alejandrino left, with Rachael. At one point they all visited the Adocentyn Research Library together and we discussed good books to get for the library. I spent one day taking Coralie, Glenis, and Cheryl to Muir Woods so they could experience a Redwood forest. Anna and I spent a lot of time with them and had wonderful discussions about Australia, the Aboriginal situation, comparisons between their practice and ours, and life in general. It was a powerful few days, with many good new connections made and friendships begun. The new iteration of the GII has a lot of potential. We’ll see how it develops. * What do we want to do? * What will it look like when we have it? * What do we need to do to get there? * What does prophecy say? * How is the environment – the place where we are meeting now – speaking to us and informing our discussion? 2) Developing Alliances – There are a lot of groups out there who could be of great help on issues of common concern: interfaith groups, religious groups, and environmental groups. 3) Denouncing the Doctrine of Discovery – There were some folks present who were VERY angry / enthused about this and wanted to work on getting the Pope to repudiate the Doctrine and apologize for it in 2015. While I understand the emotional reasons for outrage about the Doctrine, in my opinion action towards getting it repealed can easily become a huge waste of precious resources. I think that: a) Getting the Vatican to do anything takes years of behind the scenes work. Remember the last-minute attempts to get an apology to the Pagans piggy-backed onto an apology to Jews and Muslims that was the result of 30 years of dialogue. b) Many people are confusing the role of the Doctrine of Discovery – i.e. the Papal decrees – with the general legal precedent of “you conquered it, you keep it”. c) Even if the Pope does reverse this decree, it won’t automatically cause the sudden reversal of all legal decisions that invoked it as precedent (especially in Protestant countries). It just means that any such legal decision could be appealed with the appeal having a greater likelihood of success. Even so, there were many folks in the room who enthusiastically supported pursuing repudiation and an apology. As long as this is a committee of the GII and not the focus of the whole, I won’t object. 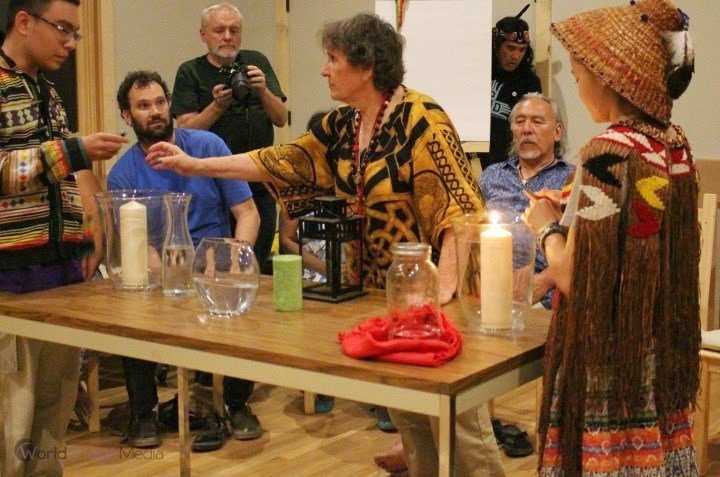 4) Preserving Sacred Gardens – This included working with governmental and environmental agencies to protect stands of forest and also working with botanical and educational agencies on preserving traditional wisdom about plants and their use. 5) Protecting Sacred Sites – This was similar to #4, but included sites that were built by people and sites without noticeable vegetation. 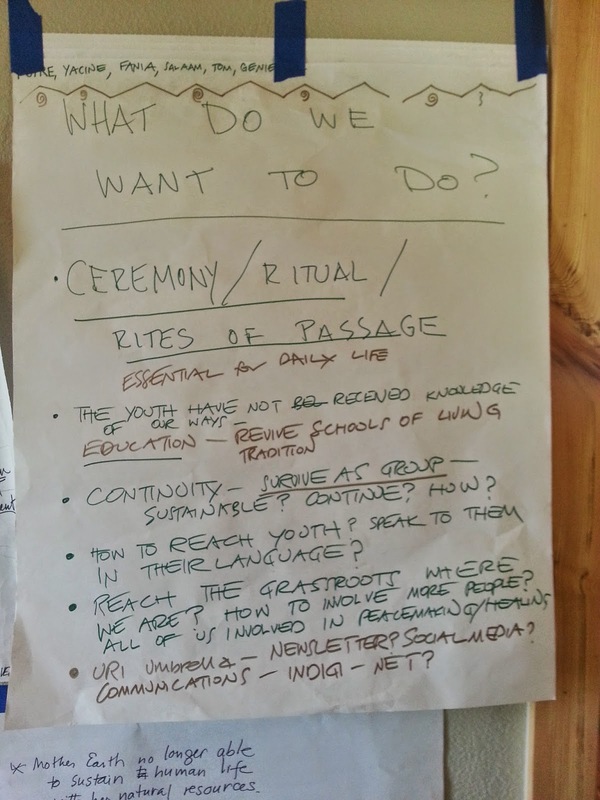 6) Protecting Sacred Ways – This was similar to #1, but included preserving traditional festivals and ceremonies. * Ta’Kaiya Blaney – Sliammon / Canada. She talked about creating sacred arts festivals to keep our young people interested in traditional ways. * Cheryl Grogan – Djabugay / North Australia. She talked about the need to protect traditional arts that aren’t necessarily sacred, such as cave paintings on her tribal lands. The government provides some protection for sacred sites, but non-sacred art sites are regularly pillaged. 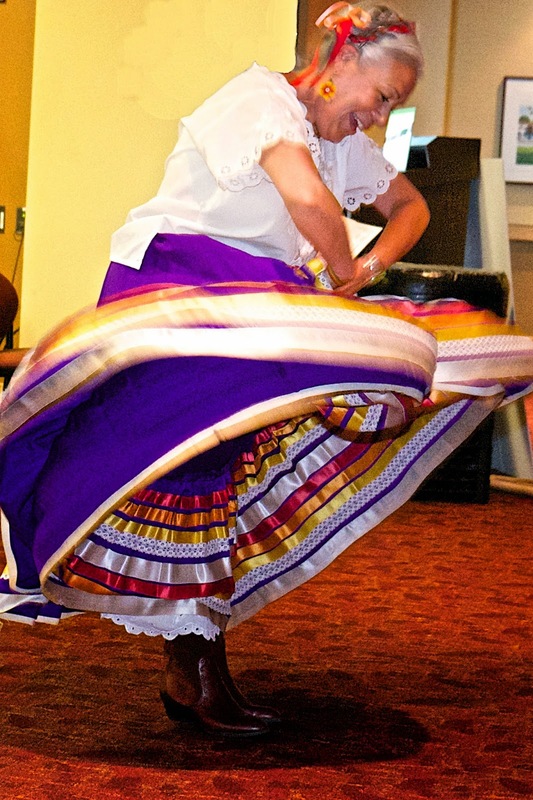 * Sofia Painiqueo – Mapuche / Chile. She expressed concern about preserving traditional arts and music in the face of the syncretic arts that result when non-traditional artists use traditional arts. The young people get confused about what is and isn’t traditional and “crap” gets passed on as traditional arts. * Fany Avila – Kuna / Panama. She echoed Sofia’s concerns about truly sacred symbols and rhythms being used by non-indigenous people in inappropriate and profane art. * Glenis Grogan (Wanegan) – Djabugay / North Australia. She proposed the idea of GII-sponsored “living cultural centers” that could travel around the world, exposing people to and educating them about, truly indigenous arts and culture. * Coralie Wason (Bununda) – Djabugay / North Australia. She echoed Cheryl’s concerns and wondered if the GII could muster support for petitioning governments for greater protection of traditional arts. * Philip “Tiger” Lane (Brown Bear) – Yankton Dakota & Chicasaw / USA. He reminded us that the Internet is still a powerful tool for educating youth about indigenous arts & culture. Ta’Kaiya suggested that we propose an indigenous reality TV show, like the recent programming about the Amish. I suggested that we start smaller, with indigenous radio programming, which would reach more people globally. Someone suggested that we try to interest “Hollywood” in more accurate representations of indigenous cultures in the movies. * I explained the Lost & Endangered Religions Project (www.religionsproject.org) to the group and pledged its support for any appropriate projects that the GII undertook. Ta’Kaiya wondered if the Rosetta Stone language software could be adapted into a tool for preserving endangered languages. I think this is worth exploring. * Liam Chinn – (URI Global Support Staff). Liam was also with us, but primarily as an observer. When we gathered back together, it turned out that a lot of our conversations had overlapped. A lot of what I wrote about above was repeated and emphasized. I think that a LOT of time was taken up with addressing the Doctrine of Discovery and making sure that some sort of statement demanding an official repudiation of the Doctrine came out of THIS meeting. June, July, and August were busy months for interfaith meetings; some of which have been described in this blog. 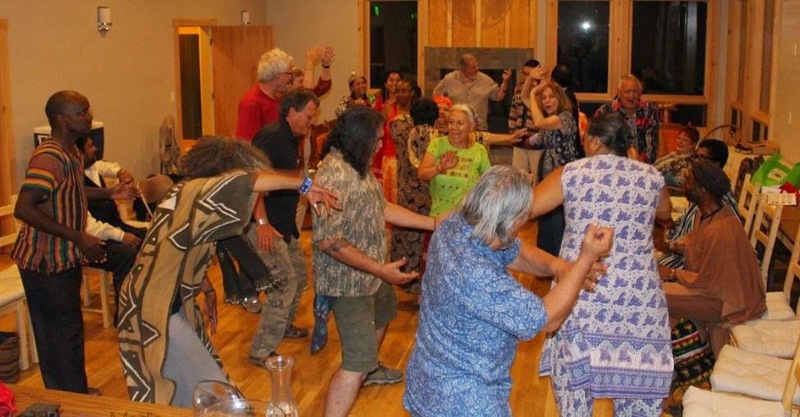 The meeting of the Global Indigenous Initiative got only a short report because I only had a short window between meetings and was then at a retreat center without an internet connection. The Global Indigenous Initiative was created in 2002 as an “Initiative” – sort of a “special project” – of the early United Religions Initiative. It met irregularly over the span of many years, with representatives from roughly 14 tribes involved at different times. 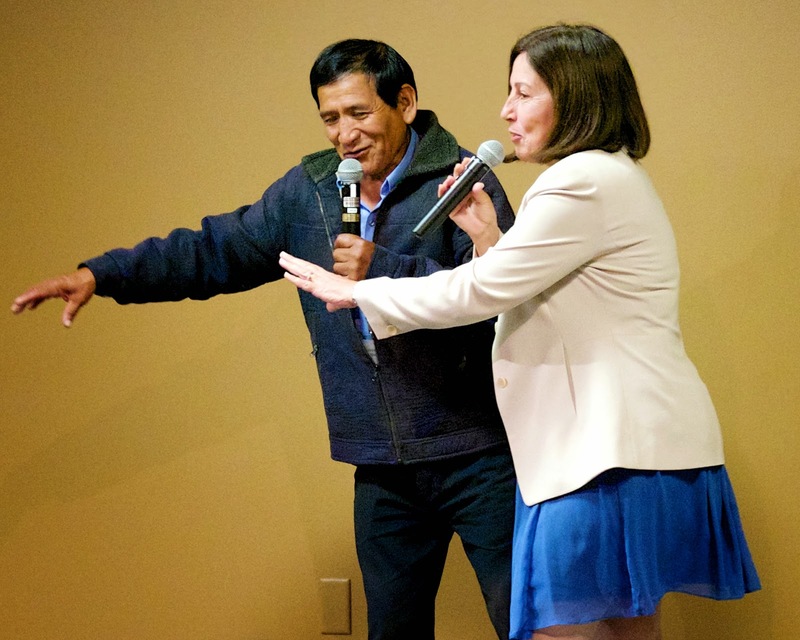 Yoland Trevino – Chiair of the URI’s Global Council and indigenous Maya was the only member of the GII’s coordinating group who both Spanish and English and so served as its liaison with the URI’s “Hub” office in San Francisco. 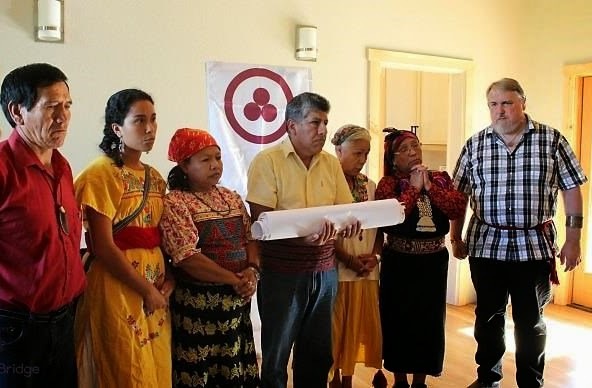 I have always thought that the GII is special in that it is an example of indigenous people organizing within the context of broader, global interfaith work, whereas most other such organizing efforts have been in opposition to the "mainstream" religions. Rachael Watcher and I attended the GII meeting held in Ayacucho in 2004, at which the Spirituality & the Earth CC (the URI Cooperation Circle I founded in 2000 with Rowan Fairgrove, Deborah Ann Light, and others) became the first members of the GII outside Latin America. With the S&ECC, the GII now included members in Asia, Europe, and North America. The S&ECC provided English lessons for GII representatives, provided laptop computers and internet access, helped with web education and support (through Rachael), and arranged for Raul to attend the 2009 Parliament of the World’s Religions in Melbourne to participate in indigenous networking efforts. As part of the transition to “URI 2.0” – with new Executive Director, many new staff, significant restructuring, etc. – there was a new commitment to the GII and a desire to make it truly “global”. 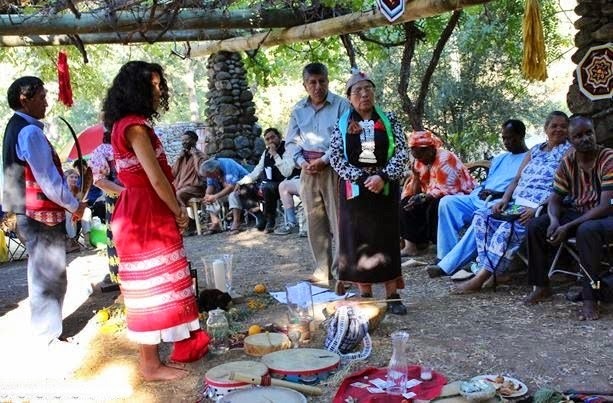 Two URI Trustees – Audri Scott Williams & Alendrino Mejia – were asked to help convene a meeting if practitioners of indigenous spirituality from around the world to discuss how the GII could move forward. Things didn’t really work out this way. The first of many wonderful moments, but the end result of the complications of getting folks there was that the GII conference started a full day late. I arrived at Four Springs retreat center early on the second day (http://www.foursprings.org/). Four Springs is a great place, with a modern lodge and rustic cabins, but its “rusticity” was tested by the 100+ degree weather. Even in this heat, the setting was beautiful, in the woods, in the mountains, above the Napa Valley. I bunked with good friend Greg Stafford, with whom I traveled to Guatemala a couple of years ago. (http://covenantinterfaith.blogspot.com/2012/07/cog-interfaith-rep-meeting-w-mayan.html) I have known Greg for about 35 years and we have shared many spiritual adventures together. He was part of the group that published Shaman’s Drum magazine and has spent considerable time studying with Latin American shamans. 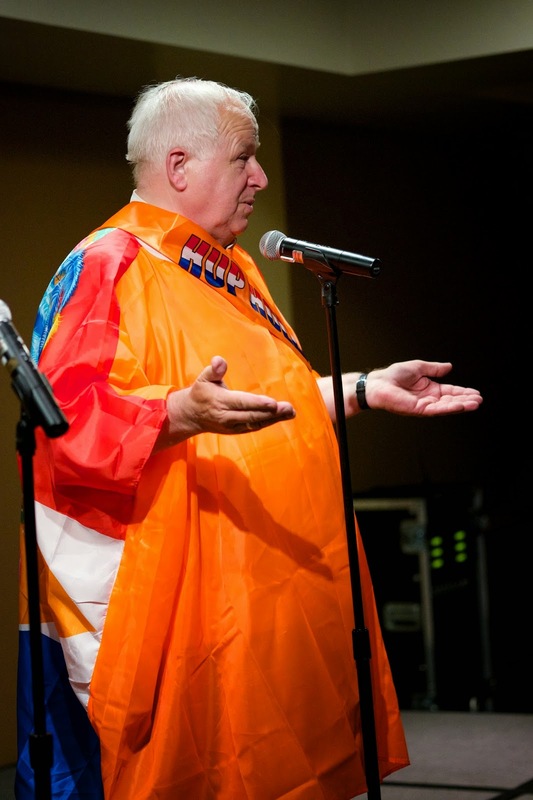 At the GII event, he was volunteering as a general “gofer”, but his knowledge of Spanish was a plus. Luz Navarette, who was Tata Apollinario’s translator at the People of the Earth event last year (http://covenantinterfaith.blogspot.com/2013/10/mayan-elder-apolinario-chile-pixtun.html), and a charming young local college student named Erika Hernandez Ramirez were our official translators. We met in a rectangular space under a huge grape arbor. We all sat around the edges of the space, while a long line of altars from the many traditions present were arrayed on the earth down the center line, in the order in which we would each do ceremony. (http://www.uri.org/files/resource_files/URI_GII_FINAL_REPORT_2014.pdf), followed by some observations of my own. “This is a fulfillment of a prophecy that the indigenous people would usher in. Welcome Brothers and Sisters. The Native and Indigenous people of the world are present here, from 6 continents. All the people are included in this process, because we are all one!! We are part of our Spirits and our Ancestors! !” – Chief Phil Lane, Jr. These are just a few of the statements that are in Audri’s Final Report, with photos from Mikuak Rai (Worldbridge Media) and Greg Harder. 1) This took a LOT of time. We started the opening ceremony on Tuesday morning, took a break for lunch, continued with ceremony until dinner time, stopped for dinner and sharing of stories, dance, and song, and picked up the ceremony again on Wednesday morning, finally finishing the opening ceremony late on Wednesday morning. With people’s departure times starting Thursday morning, this didn’t leave us with much time for business meetings. 2) It was necessary for us to be in ceremony together to establish trust and that we are one big family. This was especially true for us Witches. I have stressed that it is essential that the GII focus on indigenous spirituality rather than on being indigenous people for the simple reasons that a) the URI is an organization of spiritual people and that is a source of our strength, and b) the vast majority of indigenous people are Christian or Muslim and it would destroy the GII if these demographics were replicated over time. Even so, almost all of the 41 people present were indigenous and it was all too easy to slip into thinking that this was a meeting of indigenous people. Some folks clearly weren’t sure what Rachael and I were doing there. The unwavering support of Phil Lane and others helped a lot. 3) I thought I saw signs of a creeping “pan-indigeneity”, assuming that aspects of current North American indigenous practice (especially those developed in “powwow culture”) are normative for indigenous people around the world. a) The North American norms of red / black / white / yellow quarter colors were used as being “indigenous”. Folks whose colors were different didn’t speak up. The Australians told me later that the constant equation of the 4 directions with these 4 colors with “the 4 original couples who became the 4 peoples” left them feeling left out. Australians aren’t Africans. (Rachael and her coven made nice necklace gifts for everyone that had an acorn suspended from things with beaded sections in red, black, yellow, and white… and blue and green, so it got our colors in there, too. b) There was a constant asking of permission… of the first peoples of that place, of the ancestors, of the spirits of the natural world, of the ritual leaders, etc. I think we would be more inclined to do this once, at the beginning of a ritual, and move on. Perhaps each person felt that their piece was its own ritual, rather than part of a single opening ceremony, but I am not sure. c) The primary ritual practice was heart-felt, emotional prayer, directed towards the Creator (which was usually addressed in masculine terms). The Mother seemed to be a more immanent, but next-step-down deity. The prayers always emphasized how powerless we are to do anything without the help of the Creator. I couldn’t help but think that this was the result of Christian influence creeping in to native practice, especially since most of the folks there had been raised Christian and only returned to indigenous practice later in life. d) Everyone who spoke, spoke about “the prophecies”, and how this is the time of their fulfillment. In general, the prophecies refer to a time of falling away from veneration of the Earth, of confusion, of natural disasters, and of the coming together of the indigenous peoples and their wisdom to lead the way towards a harmonious future. (I believe that “the Asclepius prophecy” from the Corpus Hermeticum might be our version of this. At the end of the first day, we shared songs, dances, and stories. When it was my turn, I sang Charlie Murphy’s “Burning Times”, partly to help folks who didn’t already know us to understand the comparison between us as an indigenous tradition and them. Yesterday, the Northern California Local Council of CoG hosted a reception for the new Executive Director of the United Religions Initiative, Victor Kazanjian. This was an opportunity for him to meet the Pagan community of the San Francisco Bay Area and for us to meet him. A reasonable sample of the many groups of the Bay Area attended. The Fellowship of the Spiral Path graciously donated their monthly time-slot at the Berkeley Fellowship of Unitarian Universalists (BFUU) hall as a welcoming space to hold the reception. My name is Don Frew. I’m a Gardnerian priest with a coven here in Berkeley CA and I am also a Trustee of the United Religions Initiative. This reception is being hosted by the Northern California Local Council of the Covenant of the Goddess (CoG) and I am one of the Covenant’s five National Interfaith Representatives. Three more of the five are also in this room – M. Macha NightMare, Michelle Mueller, and Rachael Watcher. With four of its five National Interfaith Representatives in the Bay Area, this gives some indication of how important the SF Bay Area has been for the history of CoG’s involvement in interfaith work. That work started in 1975, when Glenn Turner joined the Berkeley Area Interfaith Council (BAIC). At that time, and for many years thereafter, the BAIC was the only interfaith council in the US that was inclusive enough to include Witches. Macha and others participated in those early BAIC events. When I joined the Council in 1985, I was immediately welcomed and accepted based on peoples’ fond memories of Glenn and her fundraising work on the Council’s behalf. In 1992, when people started talking about the upcoming the Parliament of the World’s Religions, I heard about it through the interfaith grapevine and convinced CoG’s Grand Council that we needed to support the Parliament and attend. CoG became a sponsoring organization – along with Circle, EarthSpirit, and the Fellowship of Isis – and planned to send me and two others to represent our organization. Over 40 CoG-members ended up attending at their own expense. The wonderful, marvelous, magical story of what happened at the 1993 Parliament of the World’s Religions has been told in other places – a long account is on WitchVox – and any one of the 9,000 people who were there (including me, Rowan Fairgrove, Allyn Wolfe, and many others) will gladly talk your ear off about it, but suffice it to say that the Parliament was a turning point in the history of the Craft and the broader Neopagan movement. The media called it “the coming out party for the Neopagans”. One Wiccan writer said that it was “the most important event in the history of modern Wicca since the publication of Witchcraft Today in 1954”. 1) Before the 1993 Parliament, interfaith had been about official representatives getting together and speaking in a weird form of “diplomat-ese” about the official positions of their organizations. With 9,000 people showing up for the Parliament, it was about everybody talking to everybody. Interfaith transformed from official relationships to personal relationships. Into this pregnant vacuum stepped the United Religions Initiative (URI), offering opportunities for ongoing, local interfaith work, welcoming everyone, and reaching out to provide empowerment to a grass-roots membership. 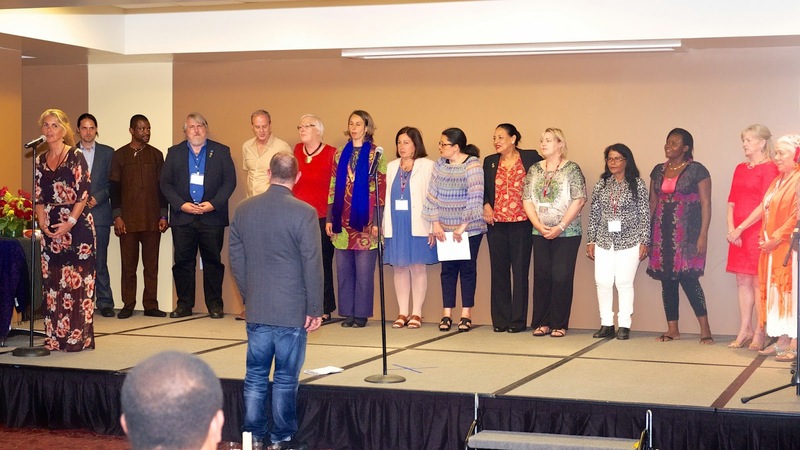 There has been a Neopagan on the URI’s Global Council – or Board of Trustees – in all four Global Council terms since the URI’s founding, and there is a Neopagan on the URI’s Global Staff as one of eight Regional Coordinators. Our presence is valued. As those of us doing interfaith have always affirmed, interfaith work may seem to be about public relations – explaining to other religions who we are and what we aren’t – but what it really is is an unprecedented opportunity to act on our principles in the world and work side by side with others on issues of common concern. The only true change comes through changing peoples’ minds, and nothing has the power to do that that religion has. Religions working together for the common good has the potential to be the most powerful force for positive change on the planet. How can we not be involved? From it’s beginnings to just last year, the person at the helm of the URI, through its first steps and its early meteoric growth, was its Executive Director, the Rev. Cannon Charles Gibbs. Charles announced his retirement last year and the search began for a new ED. After the job description was created, URI founder Bill Swing joked to the URI’s Global Council that there were two global job-searches going on right then – one on San Francisco and one in the Vatican – and the Vatican would be lucky to get our runner-up. Many of us thought it would be unlikely to find anyone who could live up to what we were expecting of the new Executive Director. We lucked out. We found Victor Kazanjian. * He co-founded Education as Transformation, an international organization working with colleges and universities around the world to promote religious pluralism and spirituality in education. * And he is an ordained Episcopal priest. At our first meeting, Victor told me that he had worked with Pagans while he was at Wellesley and that he looked forward to meeting and working with the Pagan community of the Bay Area. I said I thought I could make that happen, and this meeting is the fulfillment of that promise. Just a month ago, the URI’s Global Council held its annual week-long face-to-face Board meeting – 25 Trustees from 19 countries, plus about the same number of Staff. This was Victor’s first time in the hot seat, and he was amazing. The Global Council doesn’t exactly work by consensus, but Victor made sure all voices were heard and all concerns addressed. This is no mean feat when most of the Trustees come from cultures with very different assumptions about decision-making, administrative structures, what “grass-roots” means and how it works, what a global interfaith organization can and can’t do. The other thing about Victor is that he did all this with grace, generosity of spirit, and at least the appearance of unflagging energy and enthusiasm (‘tho I imagine he crashed hard at night when he finally had the chance). I have the highest of hopes for Victor, and the URI, and for the growing relationship between the URI and the Pagan community of the Bay Area and the world. I will give everyone a chance to introduce their groups soon, but first it is both a pleasure and a privilege to welcome Victor Kazanjian." Victor gave a wonderful talk, which I wish I had taped. He thanked the CoG-members with whom he had been working for our insight and support. He talked about the URI and the opportunities it offers for interfaith cooperation. he talked about growing up in a multi-faith household. He talked about the urgent need to bring the Divine Feminine back into our spiritual lives and to listen to the wisdom of the Earth-based spiritualities. He told us about his experiences at Wellesley, inlcuing what happened when a Pagan student group wanted to join the student interfaith council... Apparently, although there was a lot of support for the Pagan group, there were also a few groups who said that their religious communities just wouldn't permit them to be in the same room with "Witches" and "Pagans". After much discussion and fear that there wasn't a solution, someone had a clever idea. Victor's office had once been a larger room that had been divided into two rooms by the addition of an arch with sliding doors. The next time the student interfaith council met, the chairs were arranged in a large circle, spanning both rooms, with the open doors in the middle. After much tilting of heads and quizzical looks, the folks with objections decided that if they weren't actually in the same room, they could stay. 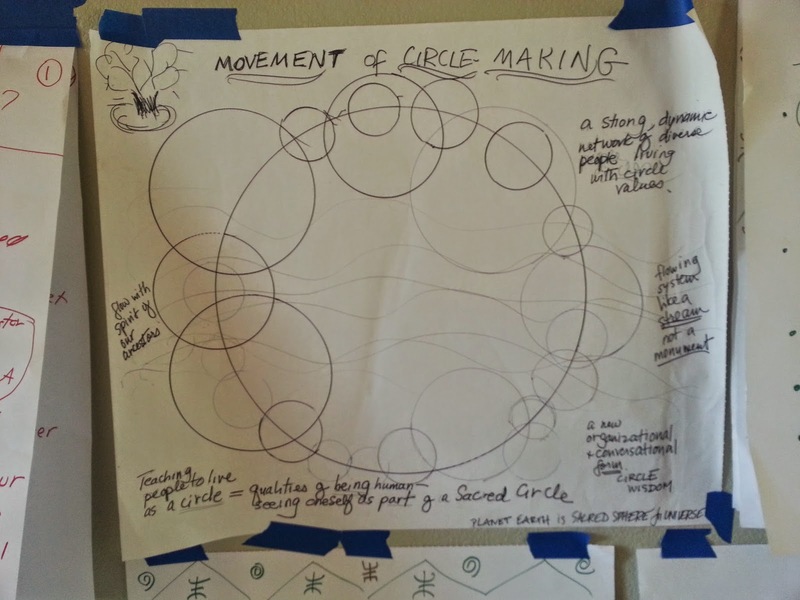 the group met this way for a few months, until enough trust had been built and fellowship created that the "two-room circle" was no longer necessary. Following this, and after I had thanked the many people who had helped make this event happen, each of the groups introduced themselves and said something about who they are and what they do. While each group had between one and three people present, each group had one designated spokesperson. After each group spoke, I asked everyone in the room who was affiliated with that group to raise their hands. This showed the vast interconnectedness of our community. It was not uncommon for someone to be, for example, a Druid, a Heathen, and active in two Wiccan covens. A further 18 groups were contacted, but could not attend. With this many groups, even "brief" descriptions ran long and by the time we had finished we had almost used up our two-hour time slot. Fortunately, the BFUU folks said that we could stay a bit longer for schmoozing, munching snacks and drinking coffee, and having smaller conversations with Victor. A "bit longer" which ended up being another hour and a half, so "Thank you, BFUU!". Louisah Teish talked about the creation of an "Overground Railroad" to address worldwide economic and sexual slavery. Glenn Turner explained that all the OTO groups were holding their Gnostic Masses at exactly the time we were meeting, so she was the only person present for a large community. Oberon Zell was very eloquent and inspirational when he talked about the early days of the Church of All Worlds, Green Egg magazine, and the beginnings of the Pagan movement in general. He stress that we were and are a "movement", i.e. always in motion, never becoming ossified. Patrick McCollum talked about how Paganism is being welcomed at the highest levels of government and at the UN. He thanked CoG for the work that we have done in building interfaith connections. Kurt of NROOGD told a story about the ,moment he realized the value of interfaith work. 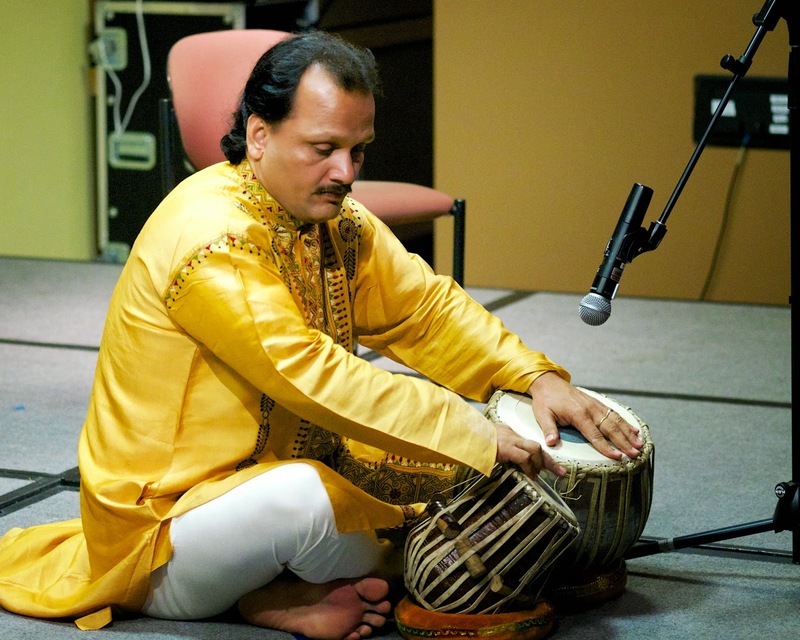 He was at a URI interfaith event in San Jose with Rowan Fairgrove. A woman came up to him. She said that she was told that he was a Witch and wanted to know how he could be at this event and worship Satan? Next to Kurt, a rabbi and a Baptist minister were having a conversation. They overheard this, stopped, and addressed the woman, saying, "Oh no, dear, Satan is OUR problem. This nice man has nothing to do with him." Kurt said that all of the tension was dissolved in one kind, humorous moment of interfaith support. I sopke with Richard Reidy and Matt Whealton of the Kemetic Temple as they were leaving and asked if they had had a chance to speak with Victor. Just as they were saying "No", Victor walked up. We had a nice chat and they suggested that Victor might want to come to PantheaCon. I explained what and when it was and Victor said that he and his wife Michelle would love to come. Then started talking about a URI program, then a URI hospitality suite, and then my wife Anna said "Give the man a break! He hasn't even gone to one yet and you already have him doing one of the most labor-intensive things you can do at a PantheaCon!" She's right. We'll start small. But I am sure we'll be doing a program. This was one of those events where the space holders practically had to shove people out the door because everyone wanted to keep talking. It ws also one where - as is always true of Pagan events - random people started volunteering to help set up and help take down as soon as they walked in the door, including our guest-of-honor Victor. Everything went very well and Victor was thrilled. I think we have this relationship off on the right foot and look forward to where it will go. I had breakfast with Victor and Peter. Peter had been the Creative Director for the opening, closing, and evening plenary sessions at the 2009 Parliament of the World’s Religions in Melbourne, Australia (http://paninternational.com.au/portfolio-item/parliament-world-religions/). We discussed how the closeness of the relationship between the URI and the Parliament has waxed and waned over the years and what we could do to make sure the relationship remained close and strong. After breakfast, during the short break before the next Global Council session, Peter held chorus practice. He would grab just about anyone who walked by and include then, necessitating a rearrangement of singers and parts. I kept getting moved back and forth between baritone and tenor (even bass, sometimes) and got thoroughly confused. Peter is a very talented conductor, but we were mostly very amateur singers. We gathered together as a joint GC/GSS meeting and were joined by several members of the President’s Council: John and Maria Weiser, Biff Barnard, and Bill Fuller. At Kiran’s invitation people called out the names of those not with us. Some were absent due to health issues – like North America Trustee Rebecca Tobias (Jewish / USA). Some were unable to get visas in time – like MENA Trustees Tareq al-Tamimi (Muslim / Palestine) and Ashraf Samir (Muslim / United Arab Emirates). Some had passed on and were now considered to be members of the “Celestial CC”. 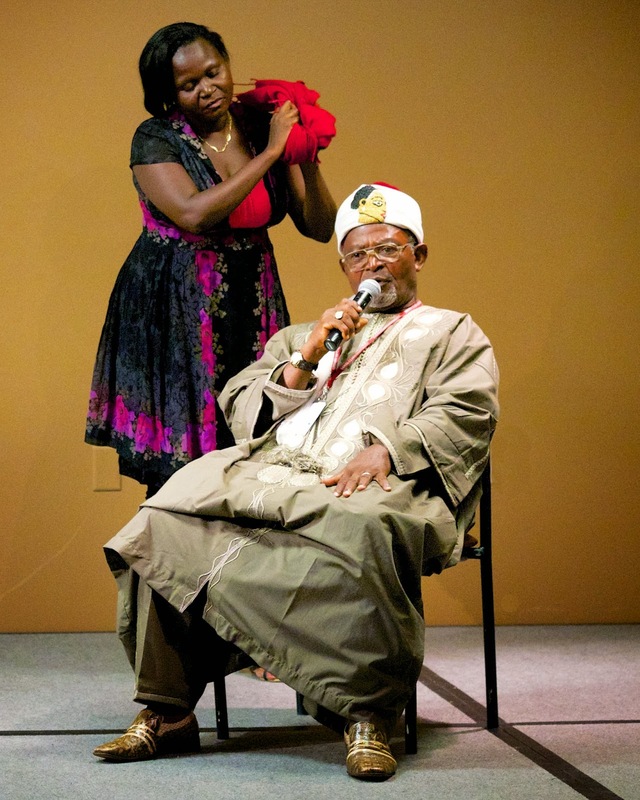 Some had business conflicts – Like NorAm Trustee Sam Wazan (Muslim / USA). 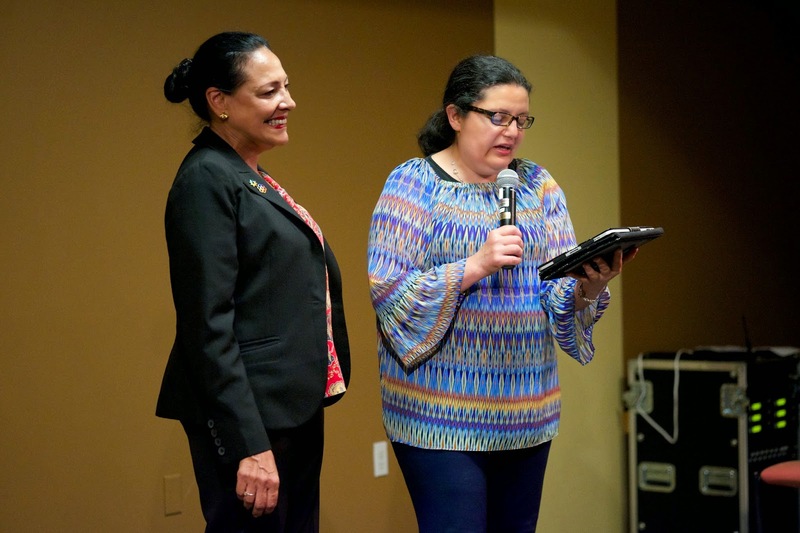 Some were Trustees whose terms had ended and were no longer on the Global Council – like former GC Chair Yoland Trevino (indigenous Maya / Guatemala and USA), former Trustee PK McCary (Christian / USA), and former Exec. Director Charles Gibbs (Christian / USA). Many people remembered family members and those yet to come who would be sitting where we were then. * Dr. Potre Diampuan (Muslim / the Philippines) – Regional Coordinator, offered a Muslim prayer. * Mr. Musa Sanguila (Muslim / the Philippines) – Trustee, did the same. * Mr. Ros Sam An (Buddhist / Cambodia) – Trustee, read a Buddhist teaching. They have 36 Cooperation Circles and two more staff persons who couldn't attend. * There is a Cooperation Circle in every city. * There is a URI TV channel. * There is a “Royals CC”, made up of royal families from around the world. * Everyone knows about the URI. * We have finally bridged the gap to those who have opposed us. * There are fewer headlines about religious violence and more about religious peacebuilding. * The work of the Global Indigenous Initiative has integrated the indigenous voice into the URI. * We have a global interfaith university. * The URI has won the Nobel Peace Prize. * Any CC can easily reach any other CC. * Funders and investors seek us out. * The Regions are strong and self-sufficient. 2) Create a global action in which each CC can participate with achievable and inspirational results (like the “72 Hours for Peace we did at the turn of the millennium) which we can promote to demonstrate our ability to create global change. 3) Develop a global marketing strategy that can be applied locally. Other groups had very similar ideas, but many mentioned greater engagement with academia, including offering some sort of certification in interfaith work. Bill gave us all an explanation of the President’s Council (http://www.uri.org/about_uri/presidents_council). The President’s Council is mostly made up of “friends of Bill” and their fundraising efforts have been the source of 80-90% of the URI’s global funding. (The CCs themselves are self-funding. The global budget covers the Global Support Office in San Francisco, the Regional Support Offices and Regional Coordinators around the world, and Regional support for things like Regional Assemblies.) At the age of 79, Bill said, he and the rest of the President’s Council are giving serious thought to th3e long-term funding of the URI. It had long been Bill’s hope that the President’s Council could put together a $100 million endowment, the interest income on which could cover the global budget, so the Global Support staff could focus more on developing local sources of funding for CC efforts around the world. This has proven to be harder than expected. However, as we have grown, “we have touched more and more hearts”. Two years ago, one man promised Bill that he would donate $1 million a year to the URI for the next five years. When Bill told the story to another man, that man also promised to donate $5 million to the URI, but figured “Why wait?” and just gave it to us all at once. So… we are in a much more comfortable position for the next five years than we have been in the past, but “the cliff is out there”. We have three more years. 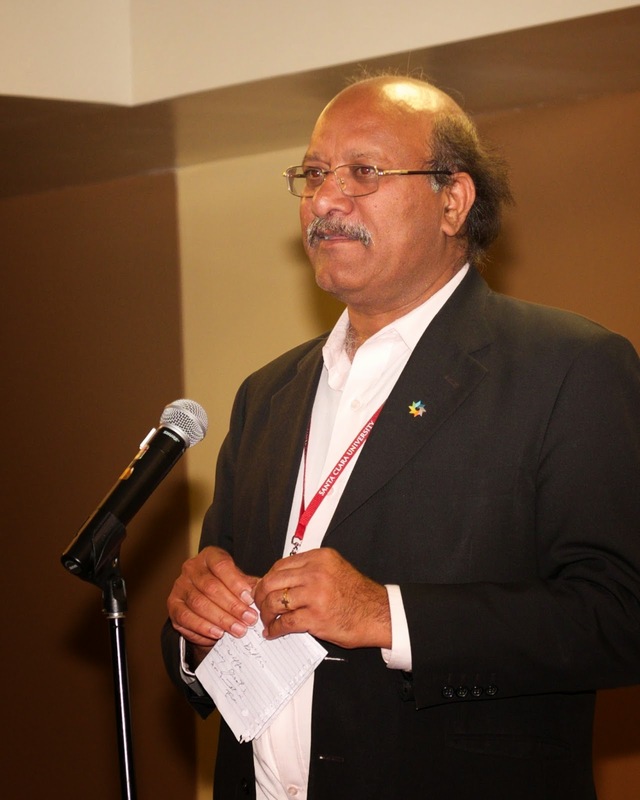 Now, when we have successfully transitioned from our first Executive Director (Charles Gibbs) to a new one (Victor Kazanjian), when we are in the middle of the 4-year term of our fourth elected Global Council (I have served on all four. ), when we have had two Global Assemblies (in 2002 in Rio de Janeiro, Brazil, and in 2008 in Mayapur, India), we have a track record that suggests permanence. When at a recent meeting, Bill talked to the rest of the Council about raising $60-80 million from within the SF Bay Area and no one flinched, he thought that the time had come to re-start the campaign for a $100 million endowment. He said that we have a listed membership of over 600,000 people in our CCs. If each person gave $1 a year to a dedicated fund, in two years we could afford to hold a Global Assembly somewhere in the world. If we kept that up, we could hold Global Assemblies every two years. Bill pointed out that our 600,000-member+ organization has a paid staff of only 37 people! That’s unheard of and shows that we are successful as a grass-roots organization. Bill acknowledged that the greatest givers are those who give all of their time without any recompense. Victor said that we would ritualize Genivalda’s idea of each contributing 1$, which would go towards holding a Global Assembly. I said that if it was meaningful for donors to hear that all of our Board contributes, how much more so would it be to be able to say that every one pf our 600,000+ members contribute! Victor said that the cost of doing business at the Global Support Office had reached a relatively stable state at a little over $3 million annually. He would like to grow the core budget so we could provide more support to the Regions. He would like to see us with a core budget of around $5 million in three years. A $100 million endowment would almost guarantee that. Victor started the ceremony that Genivalda had suggested days before. She rearranged the altar table in the middle of the room so that the components more closely resembled the Quarters as she understood them in Brazil. Going deosil: Tibetan singing bowl (East), candle, basket for $ (South), candle, flowers (West), small Peace Pole (North), candle. A URI logo was in the center. Victor rang the bowl and passed the basket around clockwise, starting in the East. We each put $1 into the basket while Genivalda prayed over the logo in the center. Time for lunch. I sat first with Biff and Peter and talked finance, especially the need to understand local cultures on money. I then sat with Rachael, Patrick, Karen Barensche, and Monica. Someone brought up the “Royals CC” idea and I gave them a long story about Prince Charles’s support for interfaith work, including Paganism. This was news to them and we discussed following-up with the Prince’s Trust. I went off to explore the campus bookstore and found a book on world religions with a surprisingly decent section on Wicca - Religion 101 by Peter Archer - and a book on haunted college campuses (Santa Clara isn’t). We met again briefly for Liam to pass around evaluation forms for us to fill out. Everyone felt that this had been one of the best Global Council meetings ever! * Victor explained about that night’s special dinner followed by a talent show. * Maria announced that we now had 649 Cooperation Circles, with the approval on-site of Kiran’s Compassion for Animals CC in the Multiregion. We had some free time to get ready for dinner – a chance for a shower and to get into some nicer clothes. Dinner was downstairs in the student union building, in a fancier room with a stage. Dinner was fancier, too. The talent show started with our chorus. We rose out of seats all around the room and made our way to the stage singing “URI. We are one. Re-u-nit-ed, We be-come.” This continued as a background between several folks offering blessings from their traditions. I had originally prepared a blessing for the meal, but at the last minute was told that the blessings would be after the meal. Instead, I invoked the memory of my blessing at the founding of the URI, explaining that the God and Goddess of the Wicca are present for my coven as Hermes, God of Travelers, and Hekate, Goddess of the Crossroads. And so, I invoked their blessing over the URI as we passed through this time of transition and found our way into the future. … Or some improvised words to that effect that I can’t quite remember. * Karen doing modern dance to Beat poetry read by Sally. * Enoe and Diana singing a Spanish love song. * Ros Sam An doing a traditional dance from Cambodia. 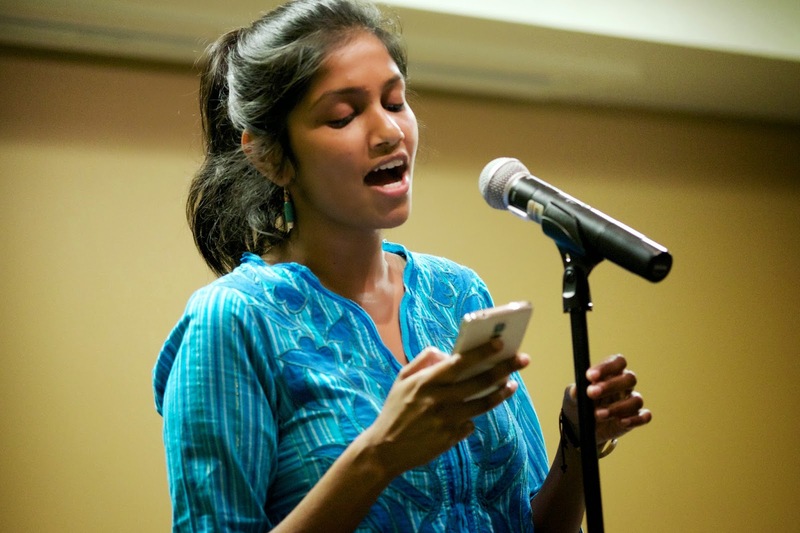 * Krithika singing a Tamil love song, accompanied by Biswadeb. * Despina and Elisha doing a skit about strange interfaith visitors at the court of an African king. 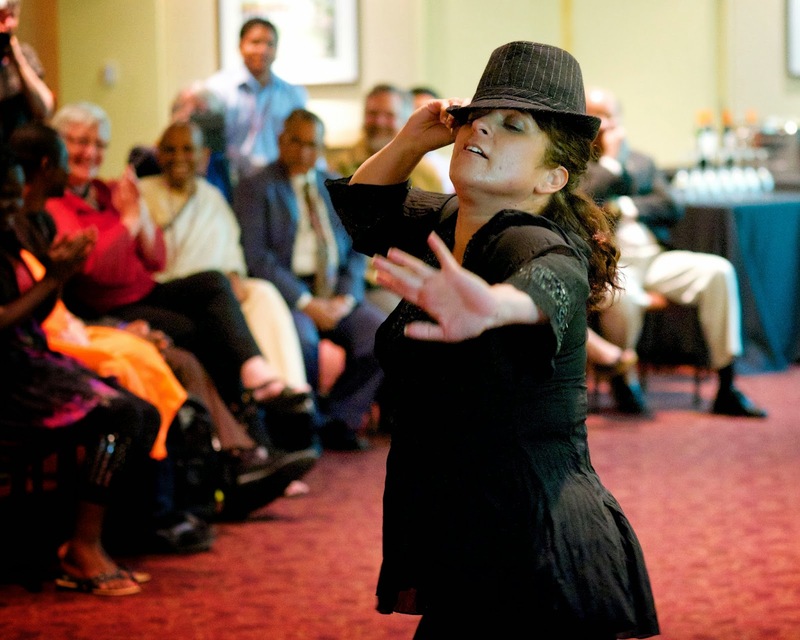 * Luz doing a Spanish dance. * Alejandrino telling jokes, translated into English by Maria. * Bart teaching us all to sing “Hup, Holland, Hup!” whenever the Netherlands was playing in the World Cup. * Fr. James Channon doing stand-up comedy about life in Pakistan. 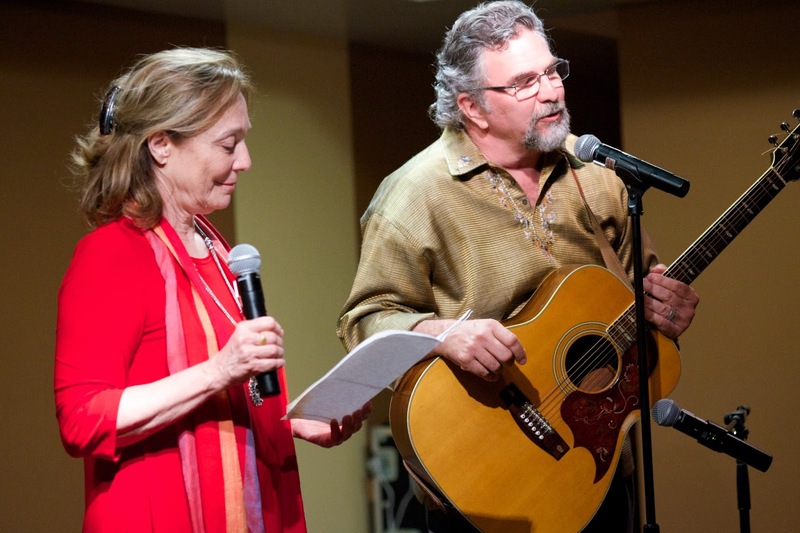 * Victor playing guitar and leading us all in Beatles and Carole King songs (with lyrics held by Sally). 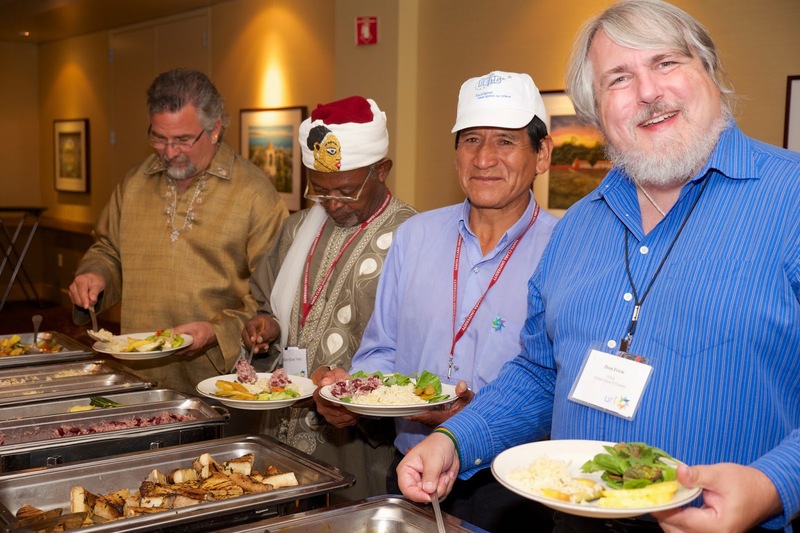 This is really what it’s all about… the reason we are here: Interfaith relationships becoming lasting friendships becoming an ever-growing global family. After this part of the evening wound down, Alejandrino and I made our goodbyes, packed our bags, and headed out. I got him to the Mercy Center in San Mateo – midway point in his journey to the Global Indigenous Initiative meeting – around midnight. After sorting out his room, I made back to my home in Berkeley around 2am. Next up, the Global Indigenous Initiative.